It may only be the first day of November, but I find that the time between now and Christmas flies by quickly. Last year I got into the groove a little sooner than normal and found the time to create some handmade gifts and crafts, two things I’ve wanted to do more of, but never really found the time to squeeze them in. So what was different about last year? First of all, my son no longer plays hockey, which has freed up a lot of time because we’re no longer running around all over the place. Another reason has to do with planning. I start looking for ideas online and in magazines at the end of October so I will have time to gather everything I need and still have time to put it all together. I find inspiration from Better Homes and Gardens, Martha Stewart, Chatelaine, Style at Home and several blogs. 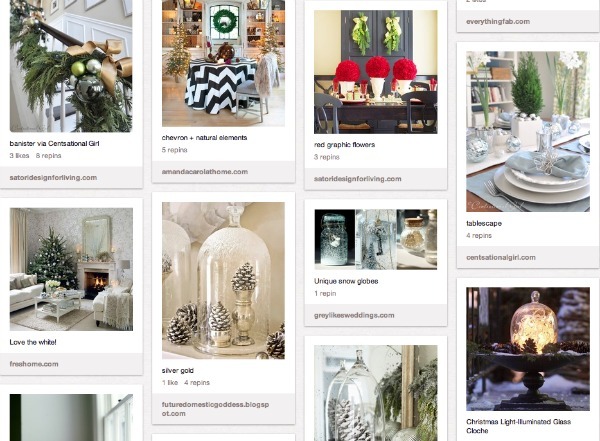 These are all fantastic, but my favorite source of inspiration at the moment is Pinterest, where I can find all sorts of DIY, craft, decorating and gift-wrapping ideas. 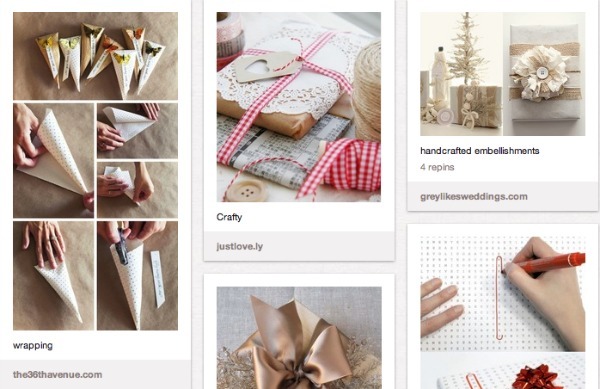 Currently, I have 4 boards on Pinterest related to Christmas. Holiday Decorating and Ideas is a general board I created last year for pinning project ideas, music, decorating ideas and other photos to do with the Christmas season. Wrap It Up is a board I created for all things to do with wrapping gifts. 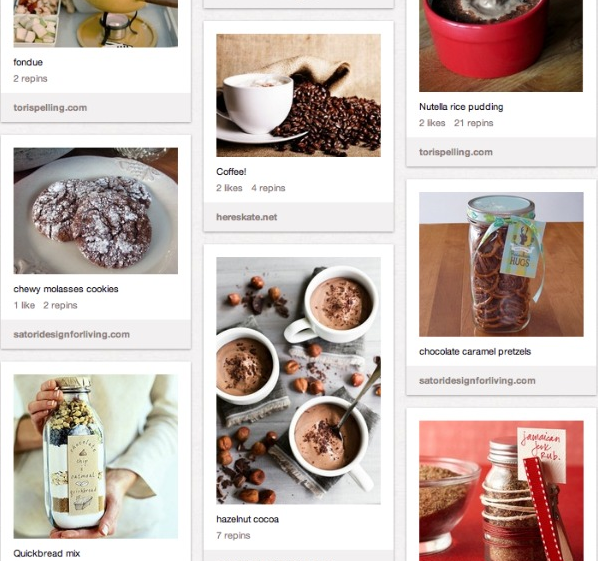 Yummy is a board I use to pin recipes to. I have several holiday baking recipes, as well as foods and drinks for entertaining. Finally, All Things Christmas is a group board I created this year for some of my blogger friends and I to share our favorite holiday pins. I encourage you to create a holiday board of your own to keep track of ideas for this Christmas season. I also invite you to start following mine if you haven’t already, and be sure to repin any you find inspiring. Let me know if you’ve started a Christmas board too! Where do you find ideas and inspiration for the holidays? 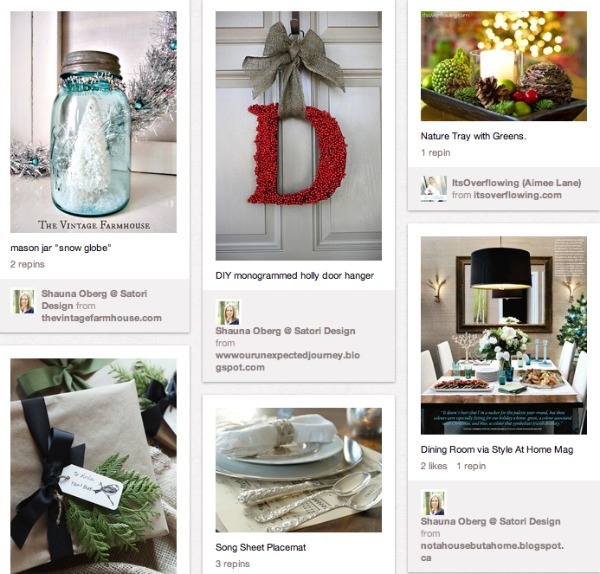 Have you pinned any projects or ideas on Pinterest you’re planning on tackling this season? I’m so excited to get started on Christmas projects. Last year I sewed gift bags and this year I want to try those mason jar snow globes I saw on Pinterest. Thanks for sharing your boards! Oh yes, I have a Christmas board, (and am now following you!) but I love the idea of having recipes that I really will only use at Christmas on their own board. And so far all my wrapping pins are under my gift board, might be a good idea to have their special board too. Thanks for the inspirations! And yes, I’ve already completed/working on a few Christmas gifts and decorations. Like you said, it flies by so fast. I was so inspired last year to get things festive for the season early on, and I credit that to Pinterest for sure. I love Christmas anyway, but it was just so much fun to try some of the great ideas that are out there! I’m excited to get started this year, too. The real challenge is where to start!